From Planning to Action: Integrated, Collaborative Care for People with Intellectual and Developmental Disabilities is a partnership among The Arc of NC, Easter Seals UCP, and the Autism Society of NC that transitions the systems-change planning groundwork of the Medical Health Home Initiative into actionable demonstrations that advance innovation and access to quality healthcare for people with I/DD. Primary care practices and providers have identified the need for access to colleagues with I/DD expertise to increase their competence and comfort in caring for children and adults with I/DD in their community. The two demonstration pilots will evaluate individual and population health outcomes, consultation structure and effectiveness, funding implications, and the impact of consultation services on access to care. Compared to the general population, individuals with I/DD are more likely to experience complex health conditions and chronic disease, co-occurring mental illness, poor rates of preventative screenings, and limited access to quality care. 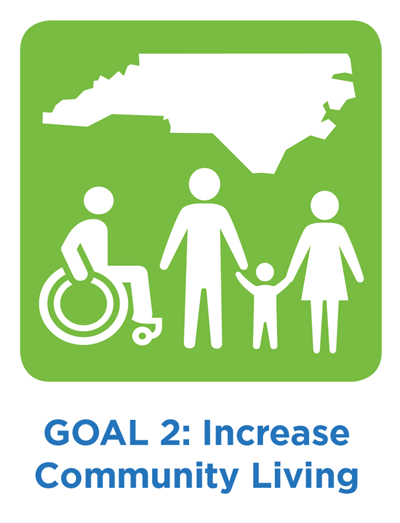 Since 2013, NCCDD’s Medical/Health Home initiative has been at the forefront of systems planning; helping ensuring people with I/DD and their families will not be overlooked as NC addresses long-term support and healthcare transformation. Develop consultation services and networks that are multidisciplinary resources that improve knowledge and skills of primary care and community healthcare providers so individuals with I/DD can access care in their community. Conduct evaluation that will measure the effectiveness of the two demonstration pilots and consultation models for scalability and adoption by policymakers and state health systems and payors. Inform Medicaid Transformation policy, practices and resource allocation to improve access to care and desired outcomes for individuals with I/DD and their families. TEACCH, UNC-CH: Increasing Access to Autism Spectrum Disorder Specialty Care in Rural North Carolina: A Project ECHO Pilot. Partnership with Autism Society of NC, Carolina Institute on DD (CIDD) at UNC-CH and Area Health Education Centers (AHEC). Cohort one with Rural Health Group practices was completed in July 2018. Primary care cohort two launched in January 2019 with a mix of healthcare providers in eastern North Carolina. Mental health ECHO cohort two is in process. Military community ECHO also started in January 2019. Duke University: Primary Care Pediatric Telephone Consultation for Children and Youth with Intellectual and Developmental Disability. Active partnership with CIDD, UNC Children’s Primary Care and Complex Care Clinic, and NC START East. Continued blending of telephone consultation with proactive outreach to practices and families. Exploring new Medicaid Behavioral Health Consultant Codes that support integrated care in primary care. Completed Resource Packet for healthcare providers. Screening for enrollment in Innovations Waiver or the registry of unmet needs. TEACCH and Duke pilots are evolving to address the needs and gaps relevant to our state. Both programs have identified the need for a consistent and robust focus on care management, systems navigation, family support and data analysis. Oral Health: NC Division of Public Health, Oral Health section was awarded an HRSA grant to support the oral health workforce through innovative continuing education. Objectives include replication I/DD workshop piloted in 2016. Project director authored an article on improving access to dental care people with I/DD in fall 2018 Oral Health Equity newsletter. Cross-System Navigation in a Managed Care Environment initiative Advisory Group member, promoting linkage between NCCDD initiative and the critical role of navigation and family support in Standard and Tailored Plans. Refinement of evaluation plan with emphasis on shared outcomes across projects and “outcomes that matter” and have the potential to demonstrate impact of consultation services. Summit: Advancing Integration through Consultation Services convened on May 23, 2018; attended by more than 65 participants representing advocates, healthcare and disability providers, Local Management Entities/Managed Care Organizations (LME/MCOs), policymakers, and MCOs. Presentations by Duke NC-PAL I/DD, TEACCH Project ECHO, University of Michigan on provision of consultative services to rural communities and Wyoming’s use of ECHO to address diverse learning needs. TEACCH: Evaluation documents project is successfully addressing two stated aims: to improve Autism Spectrum Disorder (ASD)-specific knowledge and treatment self-efficacy of rural primary care providers AND improve the quality of lifespan care received by individuals with ASD by increasing provider diagnostic screening and treatment of common medical and behavioral health comorbidities. ECHO participants report that they are improving their ability to care for individuals with ASD, have greater confidence in working with patients with ASD, case-based learning format enhances their knowledge about ASD and resources, and there are increased rates of Modified Checklist for Autism in Toddlers (MCHAT) screenings at 18 and 24 months. Leveraging ECHO success to expand reach, partnerships and financial support. Duke: NC-PAL I/DD is addressing two stated aims: establishing telephone consultation infrastructure to provide timely consultation regarding medical and behavioral health needs of youth with I/DD AND providing referral support for youth with I/DD and families to connect with appropriate resources. Developed clinical process and work flow protocols. Case-finding methodology shared with TEACCH and the protocol may be utilized by 2018-2019 expansion sites supported by NC DHHS contract. Shared evaluation focus on outcomes, impact, model alignment and development of resource directory. Year 2 summary report completed, to be posted on the initiative website. Developed brief recommending the establishment of multidisciplinary evaluation clinics across the state for children with complex needs to improve access, build community capacity, utilize state expertise and decrease family travel burden. Healthcare professionals will have increased knowledge and capacity to address the health and support needs of individuals with I/DD and their families. People with I/DD and their families will partner with healthcare professionals in decisions affecting their healthcare and disability services. Relevant health outcomes and measures will be identified and aligned with value-based payments and incentives. Sustainability plan that promotes expansion, scalability and adoption of consultation services and infrastructure by state health systems, managed care organizations, and insurance plans.